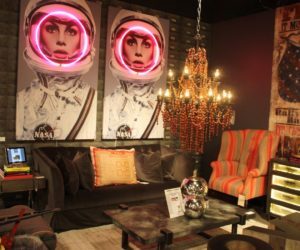 A record number of furniture and decor designers and manufacturers converged on Las Vegas to present new designs and popular favorites, and Homedit was there to cover it for you. 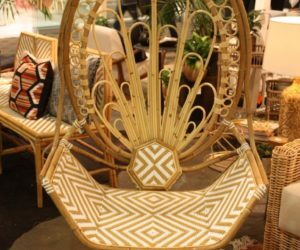 Modern new sofas, rustic home accessories and unique home decor pieces are among our picks from this year’s fair. 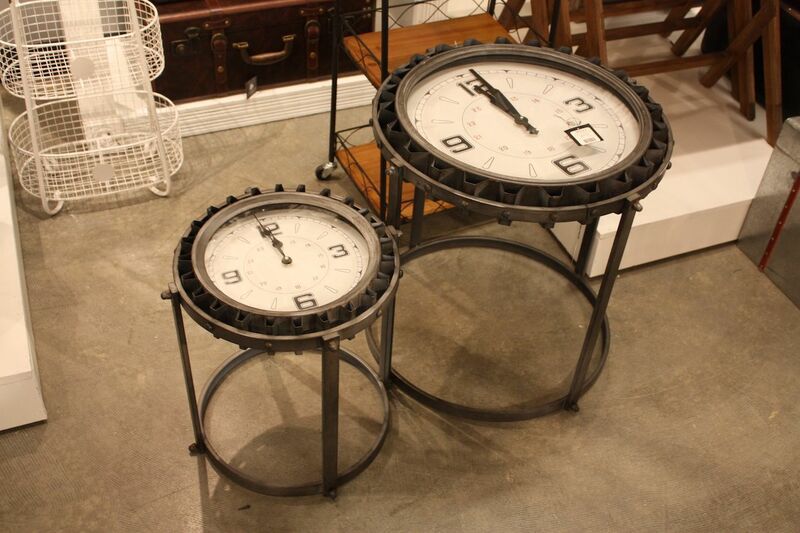 As always, it was difficult to choose, but we’ve pulled together a collection of some stand-out pieces for your home. Small, multiple table are more versatile than one really large table. It’s easy to see why the collection is so hugely popular. Both roman and arabic numerals are popular. 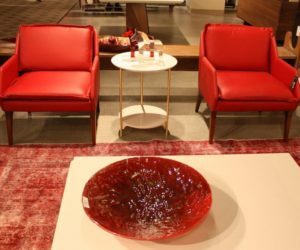 Leather furniture is a perennial favorite and Abbyson Living presented its new line of leather colors that are perfect for adding a bold pop of color to a room. 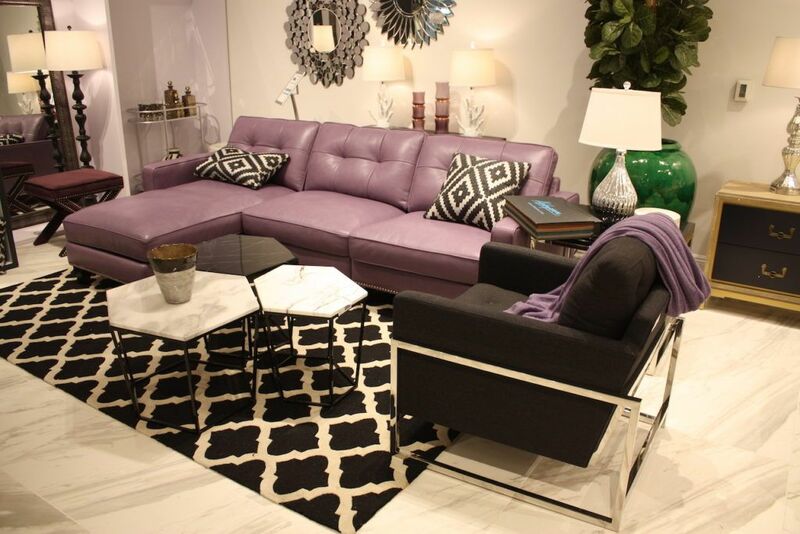 Whether you opt for a large sofa, like the Tiffany model in a luxurious mauve color. The new line includes comfy armchairs and other sofa styles in bold colors such as green, teal and pink. A colored leather piece is perfect with an overall neutral palette. The Colette Sofa Chair from Cyan Design is a nostalgic nod to the days when courting couples were not allowed to sit directly next to one another. This modern version in smoked gray velvet has ample tufting and is perfect for lounging and conversing with a bestie or loved one. It can easily work into any color palette and is a grand spot for some bold accent cushions. 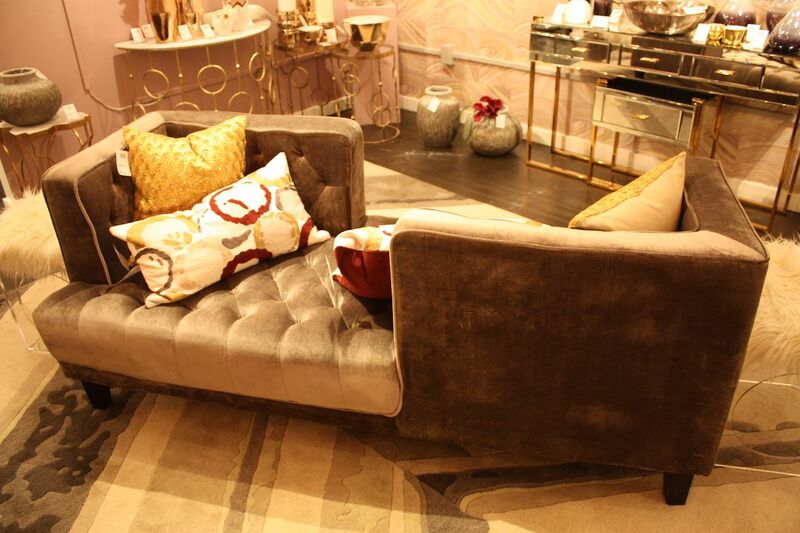 The color makes it versatile and the velvet renders it luxurious. 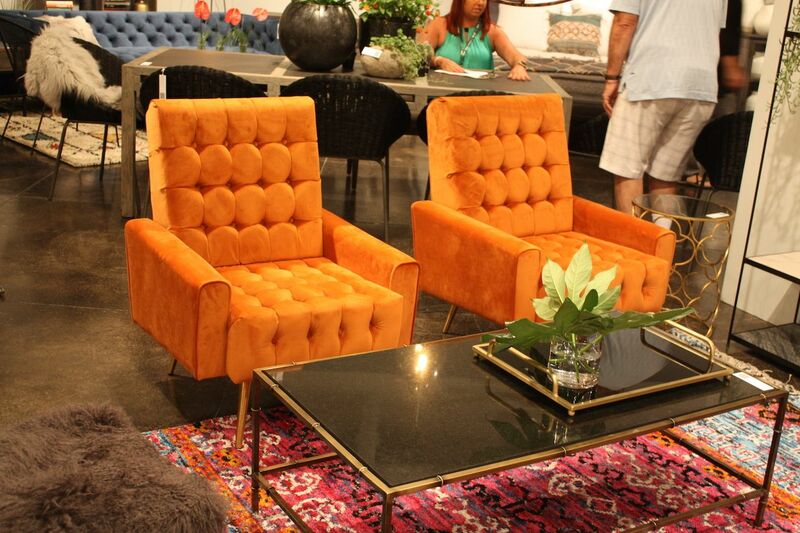 Dovetail’s velvet armchairs in a vivid orange provide a serious pop of color to a living room. 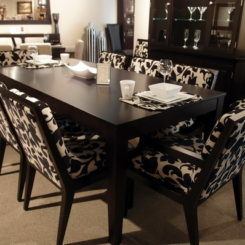 The bold chairs work well with this printed rug but would also be very at home in a room of neutral pieces. Bright chairs are wonderful for experimenting with color. 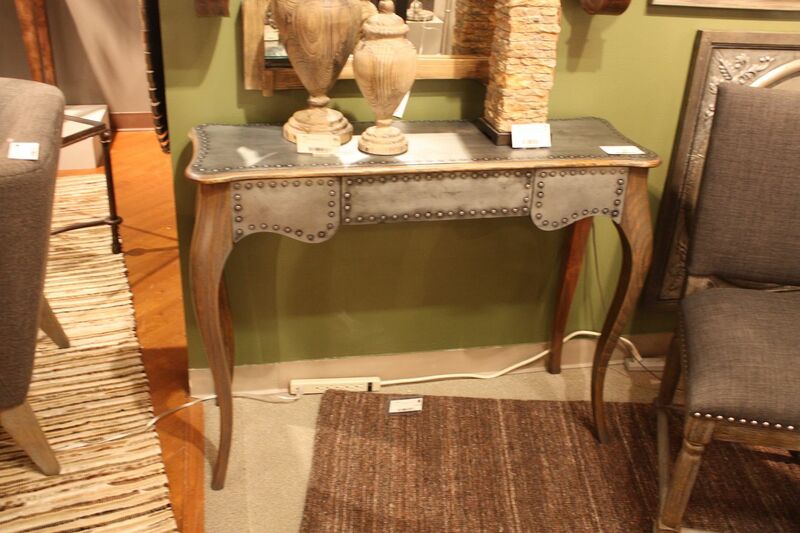 Console tables are common in entryways and living rooms, making them an excellent statement piece. 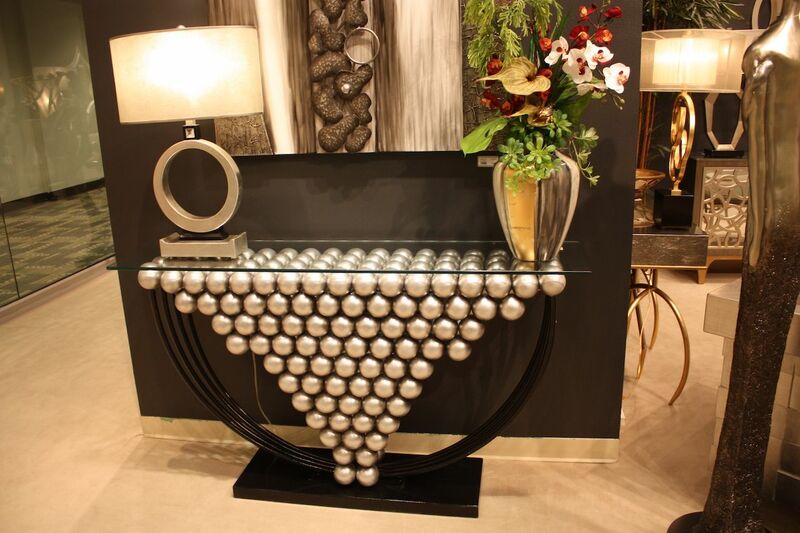 This one from ArtMax Furniture is dramatic and artful, also providing a metallic accent in a spot where family and guests get their first impressions. Pair it with a large shiny mirror or piece of art, as is done here. 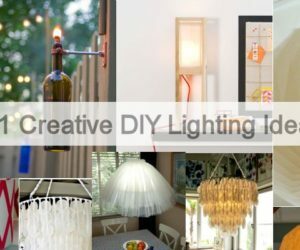 Accessories such as lamps can play up the metallic element, or soften it. The more sedate, yet no less interesting, console from Mercana is metallic but with a retro, industrial feel. The dark frame outlines the simple angles, highlighting the metal. 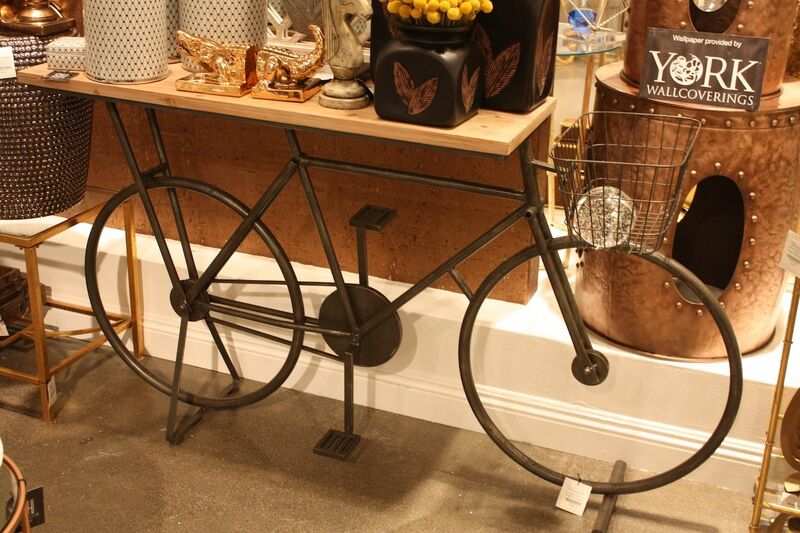 Rivets across the front, the frame and the handles bring it an industrial edge. 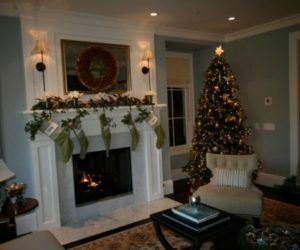 This can be enhanced by the accessories and wall decor. 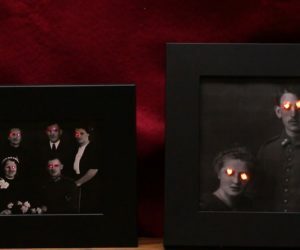 A silver and black piece is paired with vintage photos instead of a mirror. 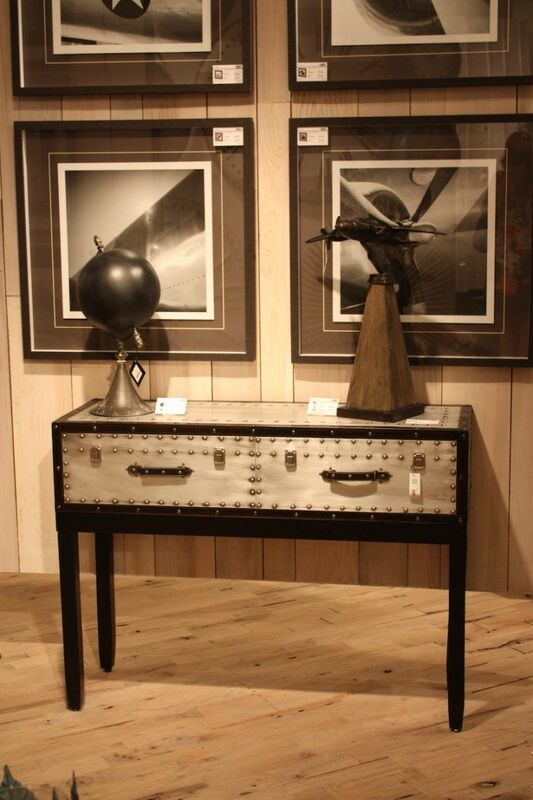 Similar metal and industrial studs on this console form Uttermost yield a very different, eclectic look when paired with a traditional shape. 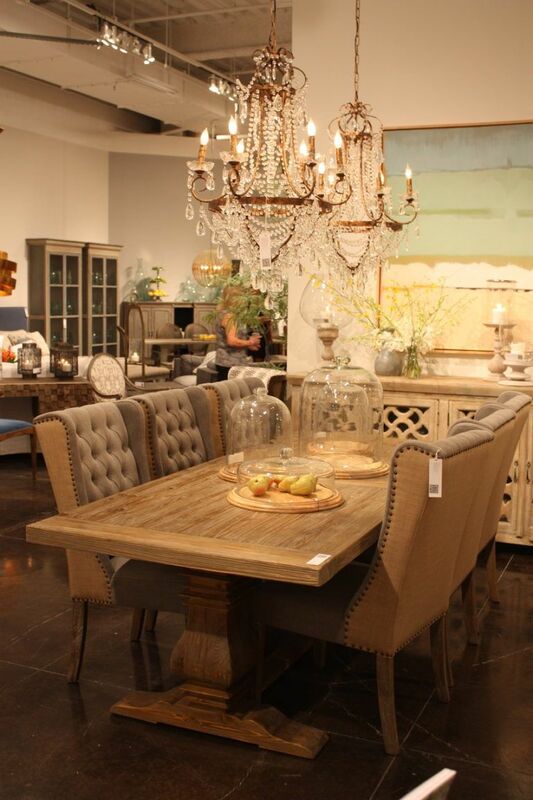 The French Provincial style table gets an edgy feel from the unexpected use of manufactured metals. This adds a rough touch to a traditional room or a bit of tradition to a more modern space. 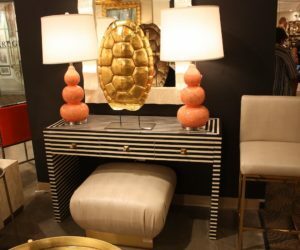 A striped console from World’s Way is a true attention getter, especially when paired with a bold color and gold accessories. This will make a statement anywhere you place it, especially if you play up the distinctiveness with the other pieces. Every home should have at least one unique, artful piece that makes guests say wow, and this wine cabinet from Cabinets Design of Guatemala fits the bill. What is now a line of imaginative custom pieces shapes like cellos and violins all started with a cello repair job gone horribly wrong. So instead of tossing his brother’s broken instrument, the artisan resurrected it as a wine cupboard and the new line was born. 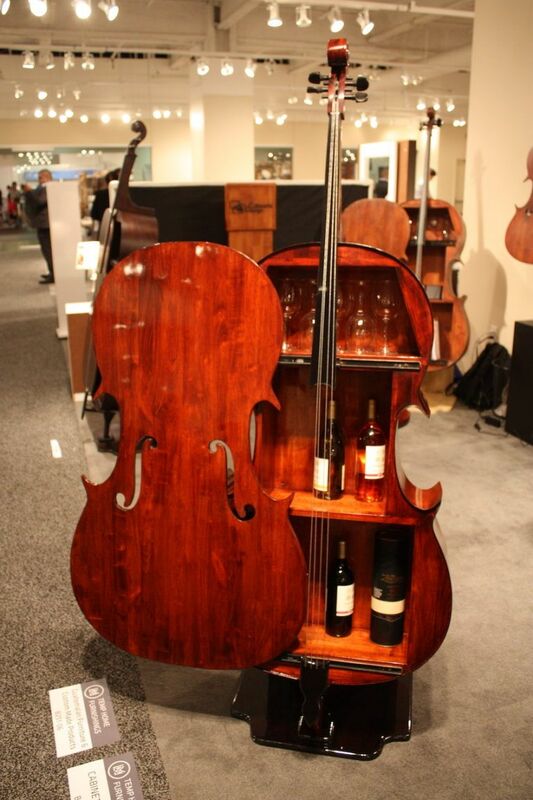 The wine cases and cello-shaped table tops are extremely popular. 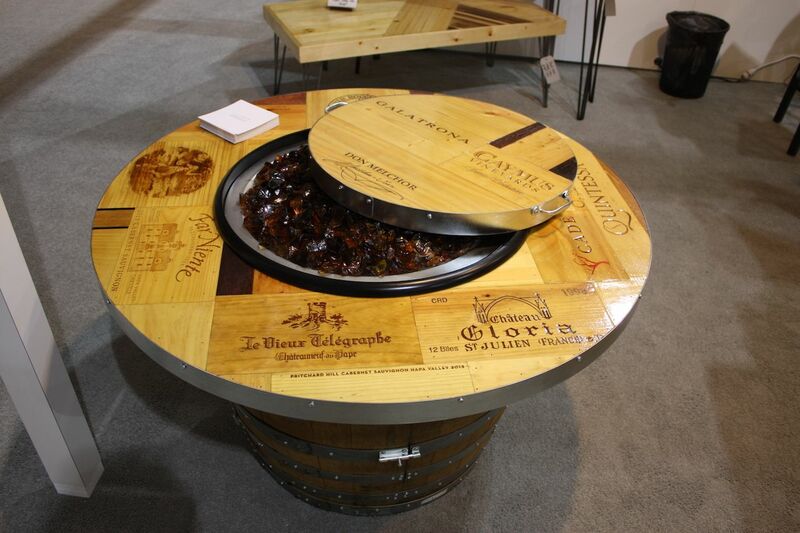 Another unique piece we found is for the outdoors — a fire pit fashioned from reclaimed wine barrels. The gas-fueled fire pit from Vin de Flame of California is a stylish addition to an outdoor patio. 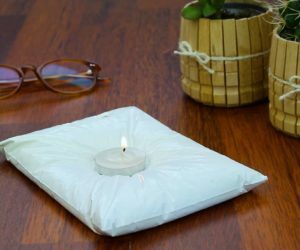 While it has a cover, it can certainly withstand the elements. The round top allies you to use it just as a table when you don’t want a fire. 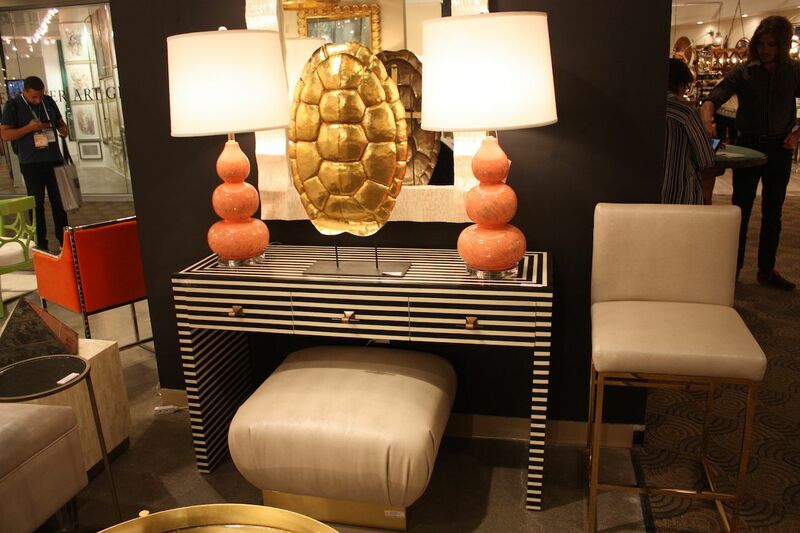 Fans of tasteful opulent designs likely already know about Christopher Guy and his amazing collection. This bedroom, centered around the Cosmopolitan headboard, left us in awe. The richly carved, mammoth-sized headboard is actually two pieces that are installed to radiate out from the head of the bed. With a headboard so dramatic, it is imperative to match it with understated nightstands and unadorned lamps, as is shown here. 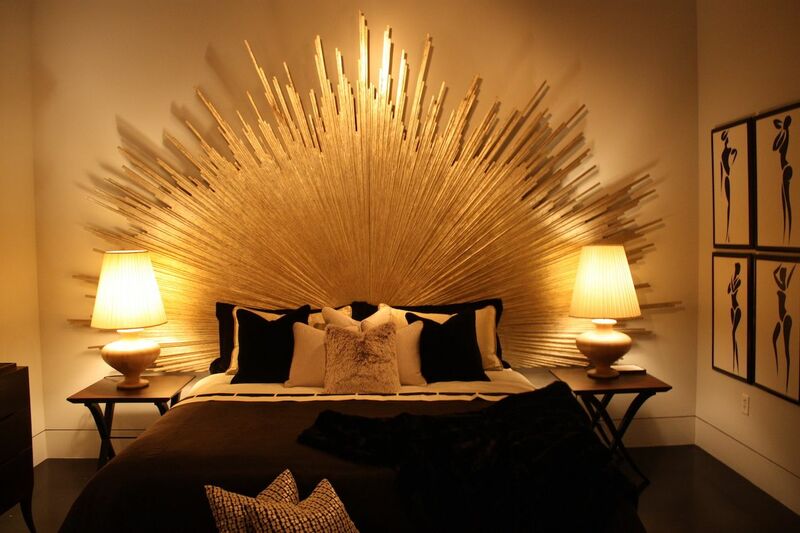 No matter what else is in the room, the headboard is the highlight. 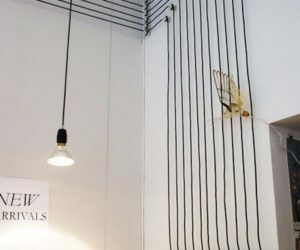 Among the new lighting fixtures we saw, the Horizontal Discus Pendant from Cyan Design was a winner in the modern category. 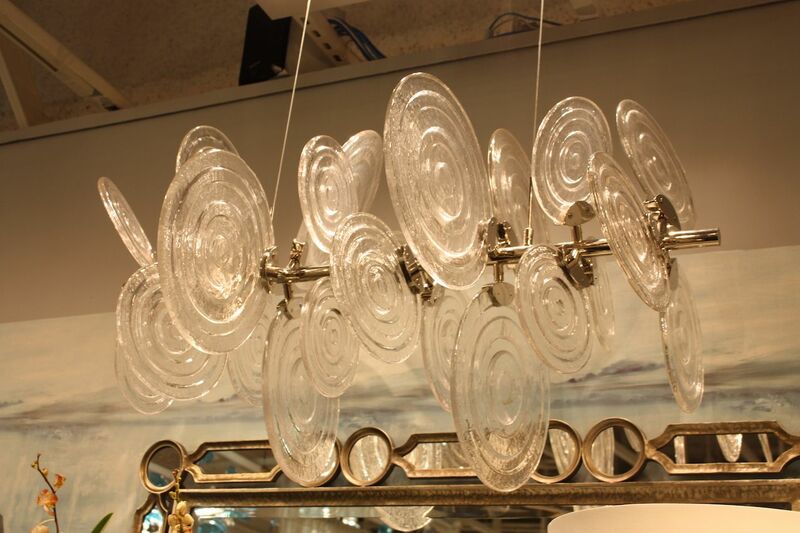 The glass discs feature concentric textural circles and are mounted on a polished nickel base. 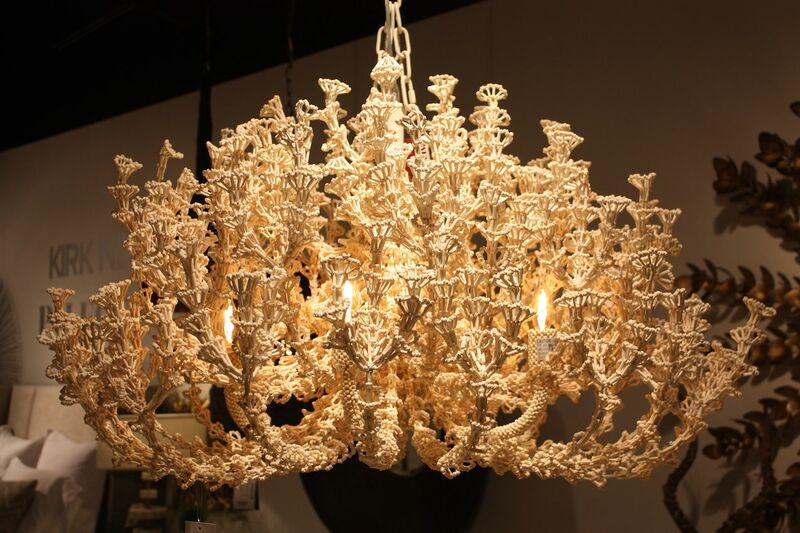 It’s a piece that would work well in almost any room for a modern, but light and airy lighting fixture. This is part of the Billiards and Islands Collection. 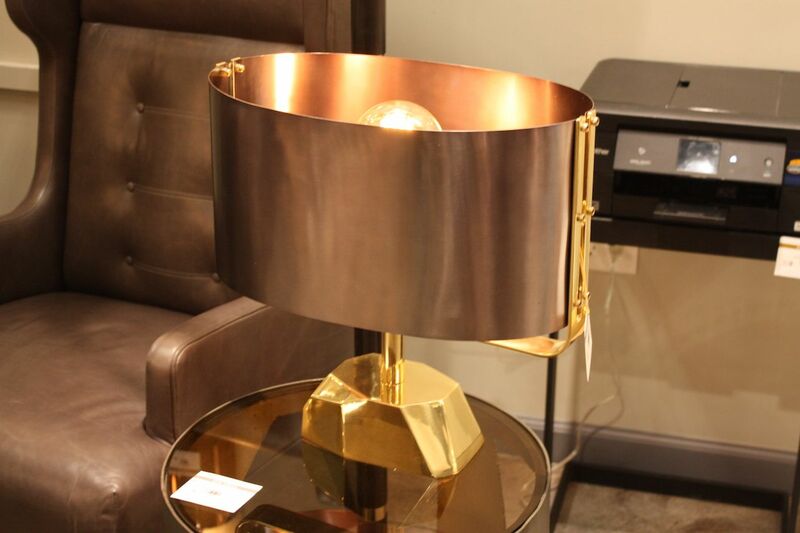 Arteriors Milli Lamp caught our attention for its wonderful coppery, rosy metal shade. The contrast between the two metals — and the faceted base that reminds one of a gemstone — is most wonderful. 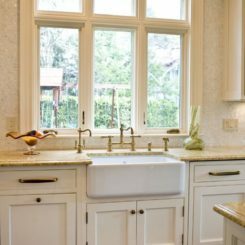 It’s an elegant yet unexpected design that is fitting for many styles of decor. Very retro and masculine, these floor lamps are also conversation pieces. 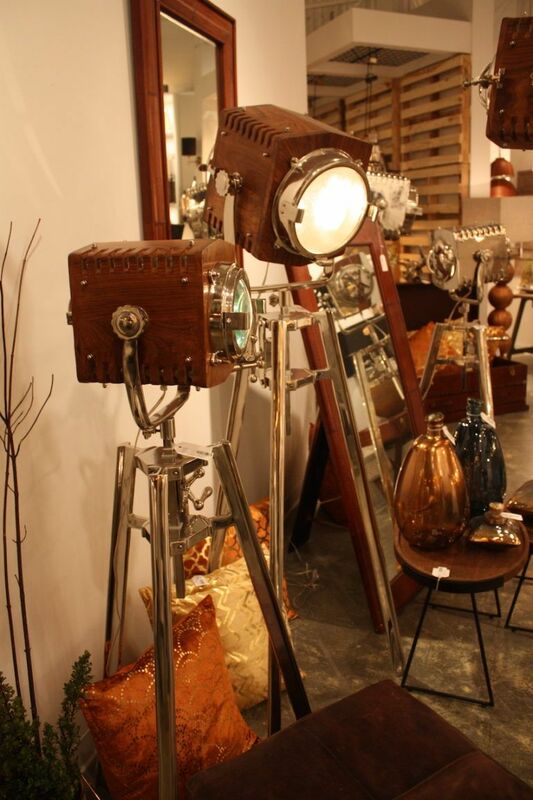 From Light and Living, they are upscale takes on old-fashioned spotlights. 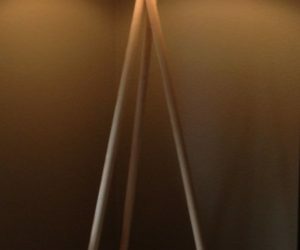 While they are great for any space, these retro floor lamps would be an exceptional addition to an office or man cave. 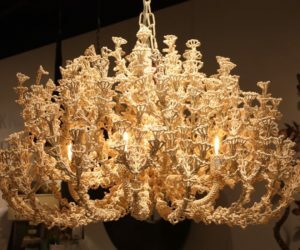 Organic and dramatic, the Seychelles Coco Chandelier is made of tiny white coco beads in a soft white finish. 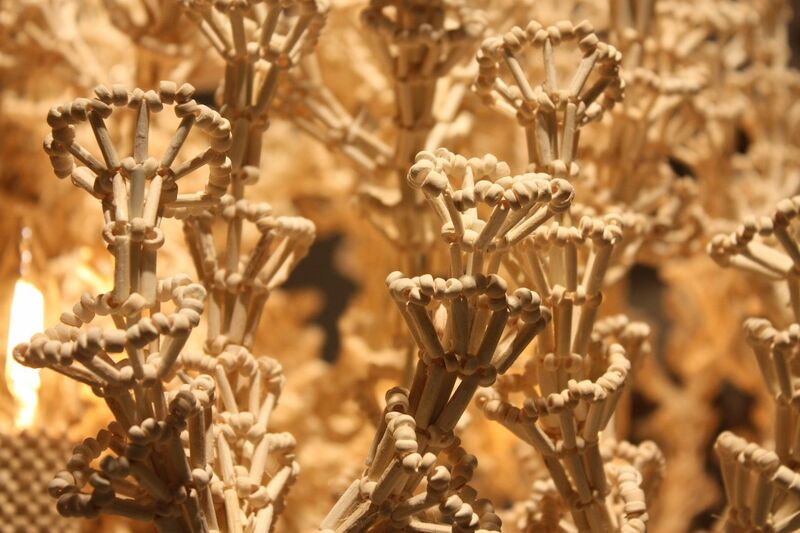 The overall effect is one of a living form, reminiscent of a coral reef feature. The construction of the fixture is mesmerizing when you get a good look at the tiny beads woven into the large piece. One of our favorite dining sets is this one from Dovetail Furniture because the study trestle table is paired with traditional style chairs that have a modern twist. A conservative wing-back shape is mixed with trendy but traditional nailhead trim and a modern mix of two burlap style fabrics. 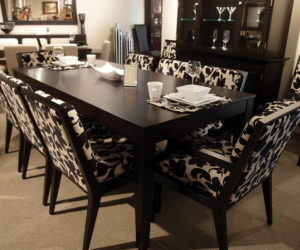 Actually, these dining chairs would easily blend with a variety of table styles. The traditional vibe is softened by the shabby chic chandelier. 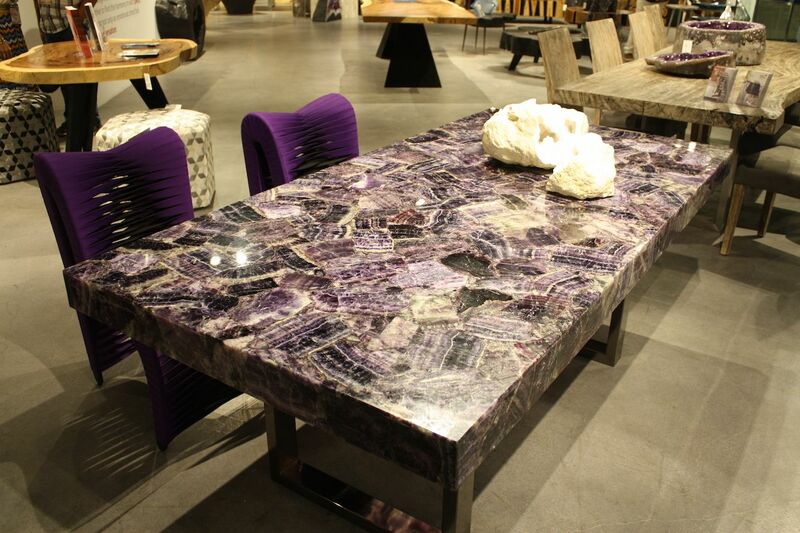 With this dining set, it was the gemstone table that drew us in. A statement in and of itself, the slab style table from the Phillips Collection has a shiny metal base. 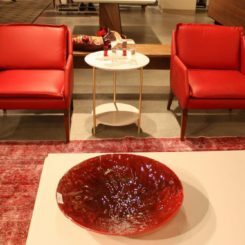 This year, gemstones in a raw form were featured as decor accent pieces, both with their related rock tables as well as wooden styles. Paired with unusual chairs, the set is decidedly modern. Lovers of puns will immediately be drawn to these dining chairs as we were. 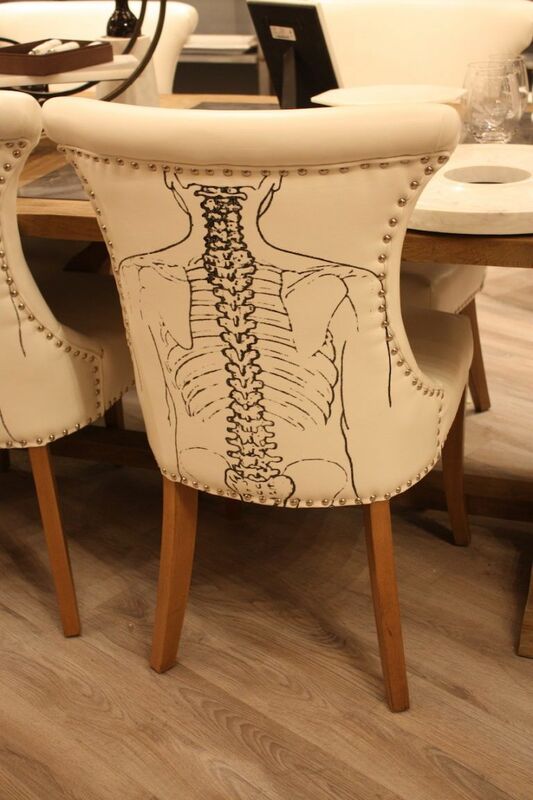 The imaginative drawings on the back of traditionally upholstered leather chairs is really different. Decorative chair backs are particularly wonderful on dining chairs because the back is actually the focal point of the chair. 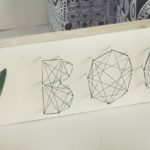 These are from Go Home. 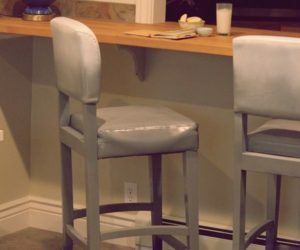 We love occasional tables for their versatility as well as their utility, and they are an awesome piece for adding some whimsy. 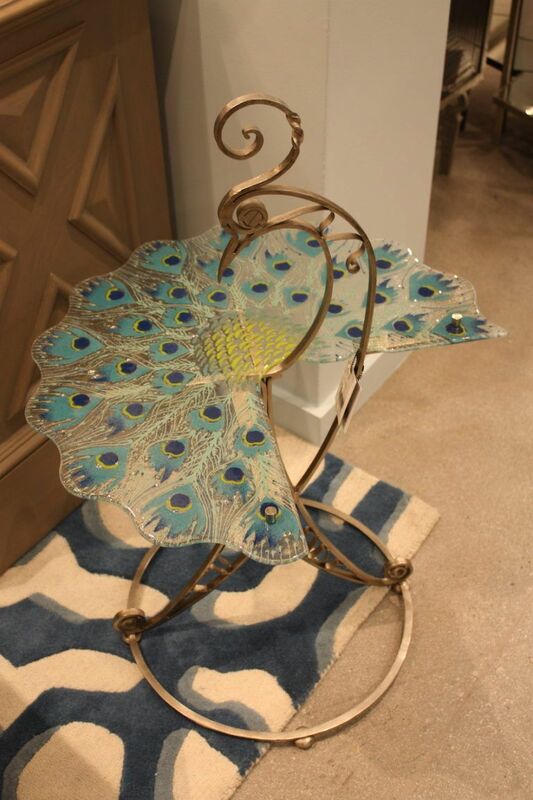 A fun peacock table from Global Views shows off its colorful glass top, decorated like a grand tail. The little table is elegant and playful at the same time. A little touch of whimsy goes with any type of decor. 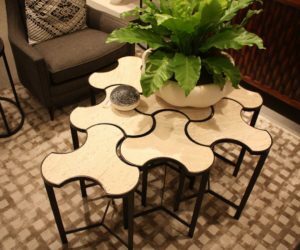 The trend of using multiple small tables as a coffee table was not as prevalent at the show as it was in Milan this year, but we did find this great puzzle-style arrangement from Studio A by Global Views. 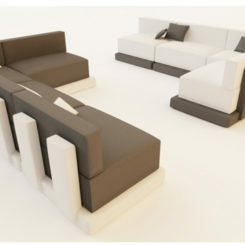 The little tri-legged shapes can be used alone or in multiples to create a table as large as you want or need. Side tables that have attractive, open storage are a real find and this one from Kalalou is very nice. 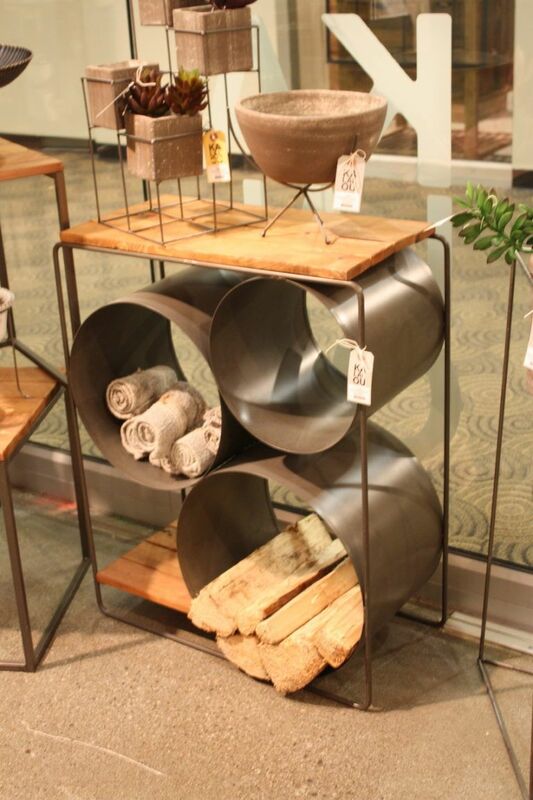 Round, industrial style tubes are a surprising counterpoint to the rectangular design of the table. 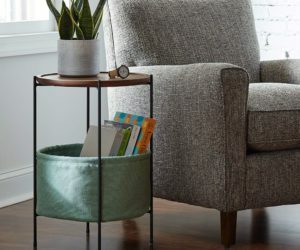 It’s a fresh twist on open storage. Rugs anchor a room and one of the most popular new lines is Magnolia Home by Joanna Gaines from Loloi. 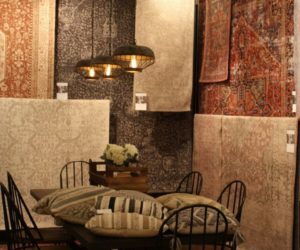 Whether you favor eclectic design, a shabby chic feel or a farmhouse vibe, these detailed yet neutral rugs are eminently mixable. 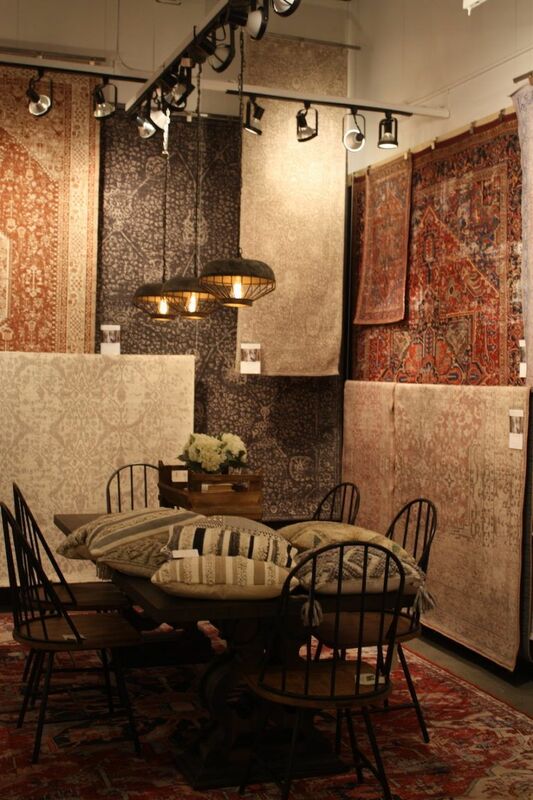 Light and dark color palettes are available and a line of textiles and cushions complements the rugs. 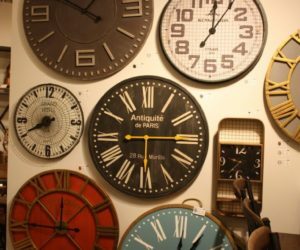 In a digital age, it’s rather ironic that we are tuning to old school clocks for home decor, but the is certainly the case as there were many examples at the Vegas Furniture Market. Mercana’s collection is a marvelous array of styles and sizes that can be used as a single accent or in multiples for a feature wall. 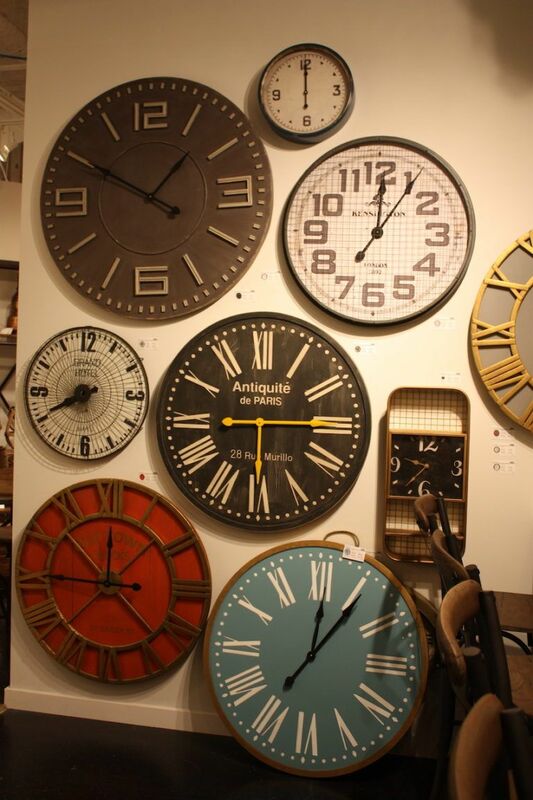 Clock faces with a gear-like frame, mounted on a rough, thickset metal base are hefty and interesting. 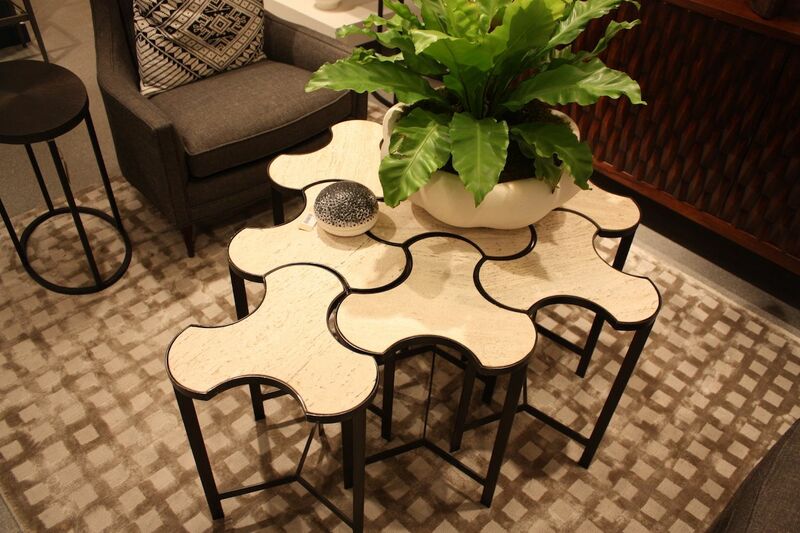 The accent tables are appropriate for any space that needs an unexpected element. The small pieces have a very hefty feel. There’s room for fun in any style of decorating. 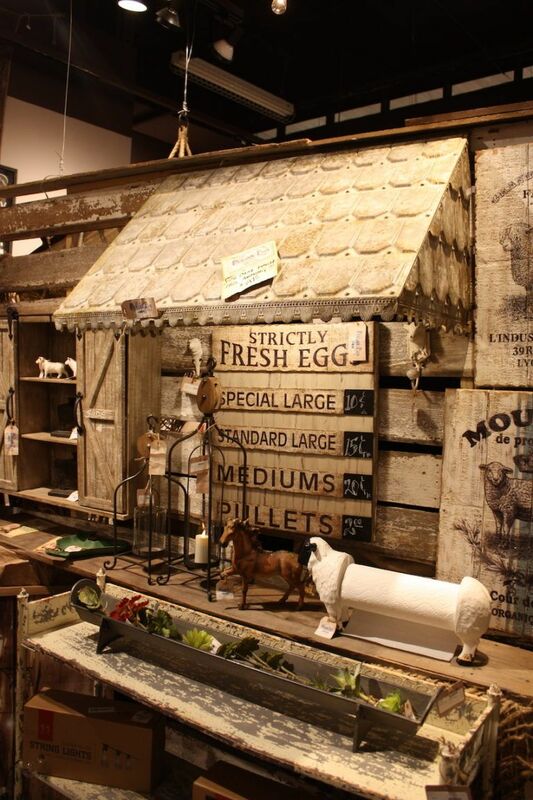 Lots of really appealing buffets and shelving units were to be found in the rustic decor areas, including this one from Bobo Intriguing Objects. 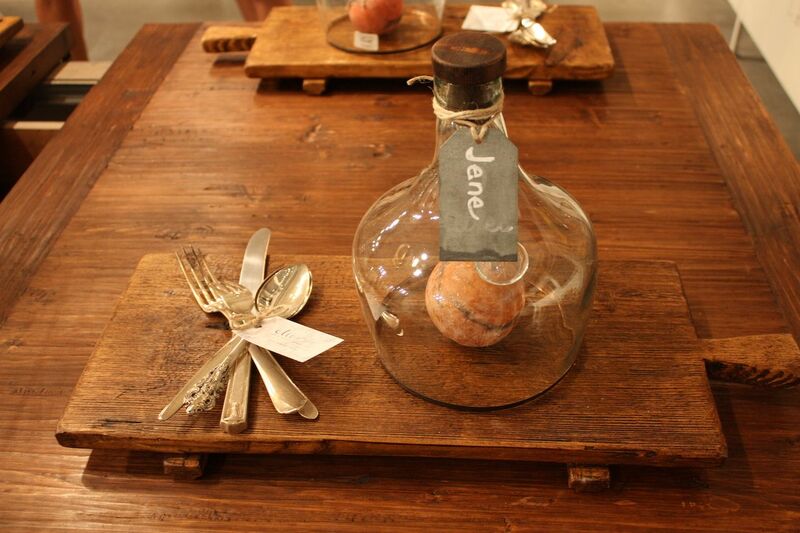 This is one of our perennial favorites for unexpectedly stylish and unusual decor pieces. 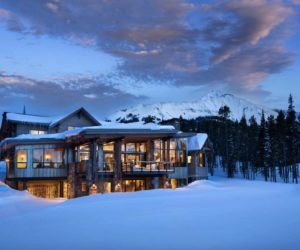 The traditional silhouette is mixed with rough-hewn wood and a pipe-style framework for the top section. 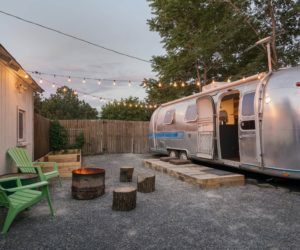 Hefty metal accessories and rustic additions play up the eclectic style. The retro accessories here are fantastic. 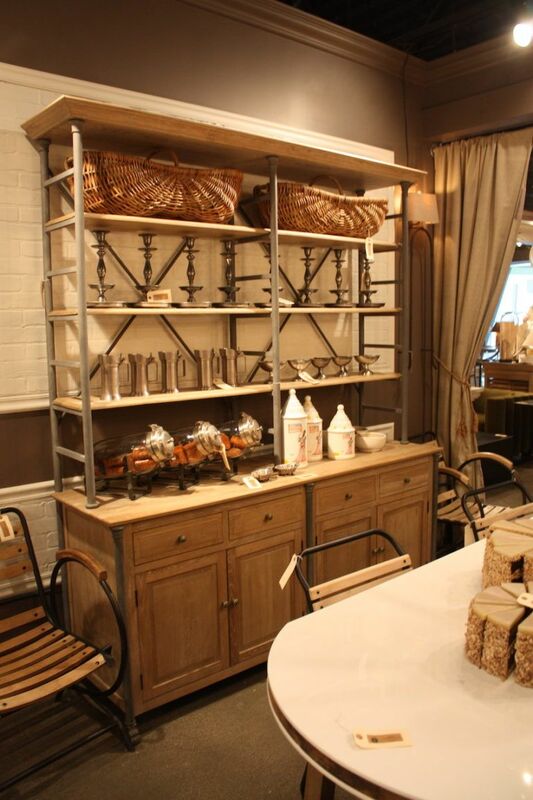 Park Hill’s rustic pieces included this buffet that sports a number of great farmhouse details. 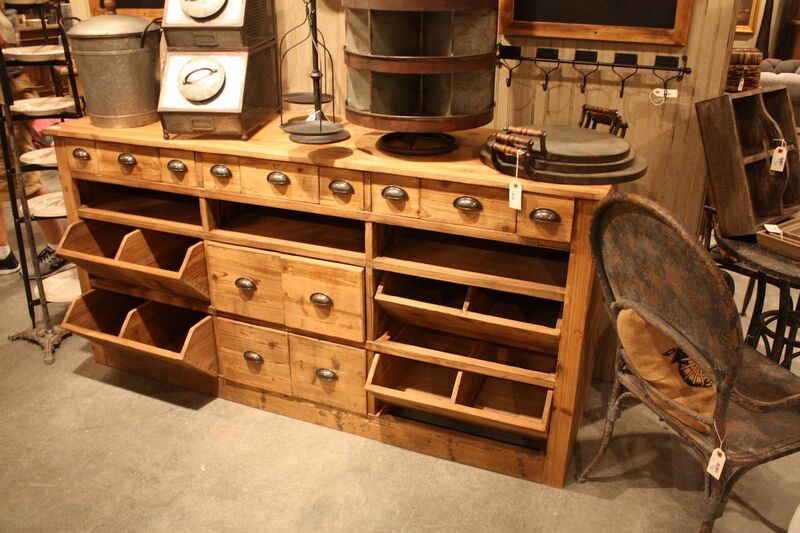 From the angled bins to the old-style pulls, the rough hewn wood buffet has ample storage as well as style. It would work well in a kitchen or a dining room. We would even love to see it in a charming craft space for storing supplies. At Peacock Park, this collection of rustic accessories was a bid draw. 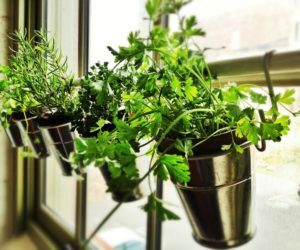 From the distressed tin awning to the country signage, animal figures and decorative trug, all are perfect for adding distinctive and homey accessories to your room. 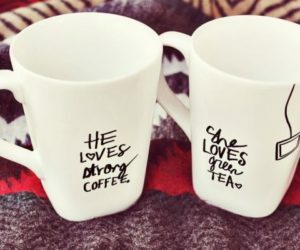 Even just one or two pieces would add charm to any space. 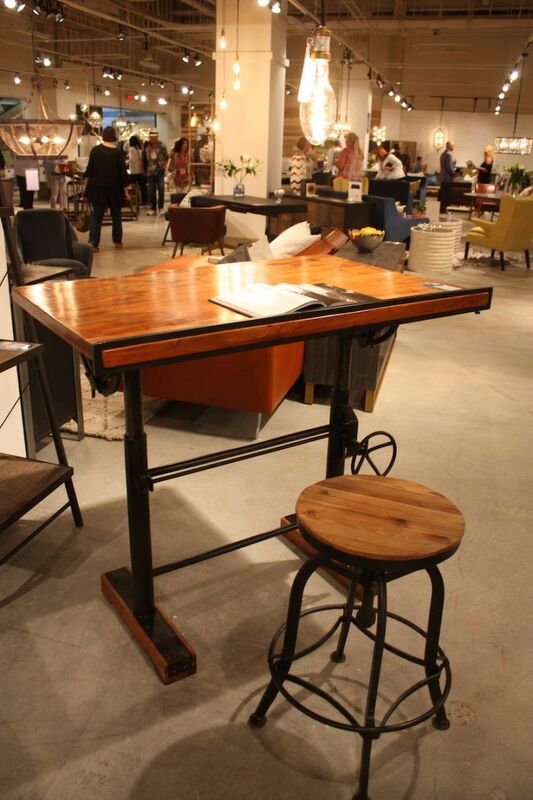 Among the new pieces at Classic Home, this architect’s desk was a standout. Warm wood with a retro styled dark metal base, it’s a great piece for an office or family area. 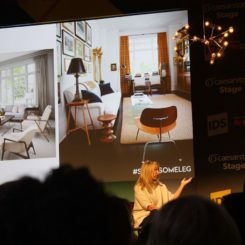 The large work space makes it multifunctional and by pairing a different style of stool with the desk, it’s possible to mix it with a variety of interiors. Sold as a desk, this is a very versatile tall table. While we didn’t have a lot of time to explore table decor, we couldn’t help exploring Europe2you, which features awesome kitchen pieces as well as furnishings. Atop a wonderful French table, these place settings were very striking. They are perfect for letting your imagination go wild, changing out the items under the bottle cloche and how you display the cutlery on the cutting board style charger. Very chic indeed. 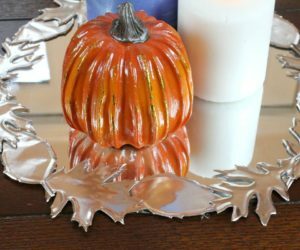 A few basic tabletop pieces are the base for a full year of seasonal decor. 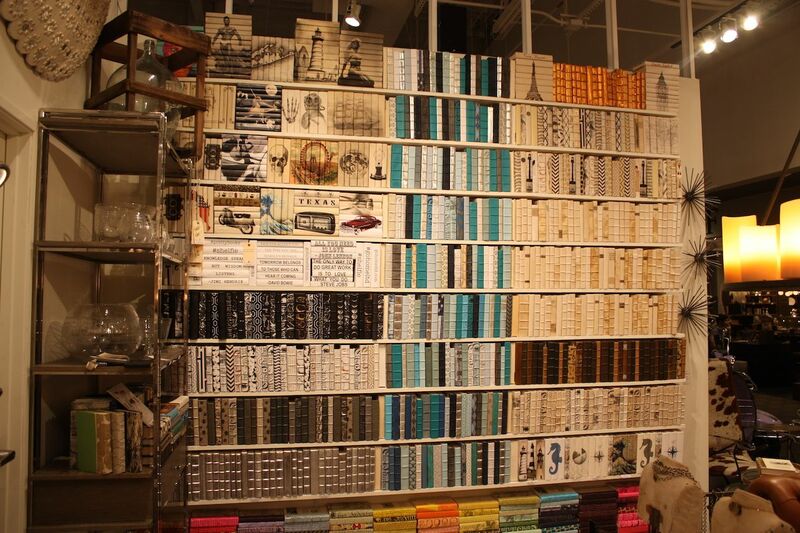 Hard to categorize and impossible to ignore, this magnificent wall of books was created by artists who cover discarded volumes in a variety of decorated papers, textile and leathers to create an accent wall. 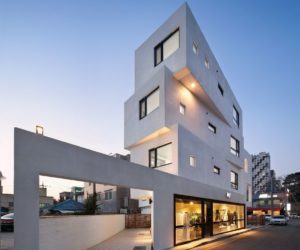 The design was presented by Go Home. This is upcycling at its most imaginative. 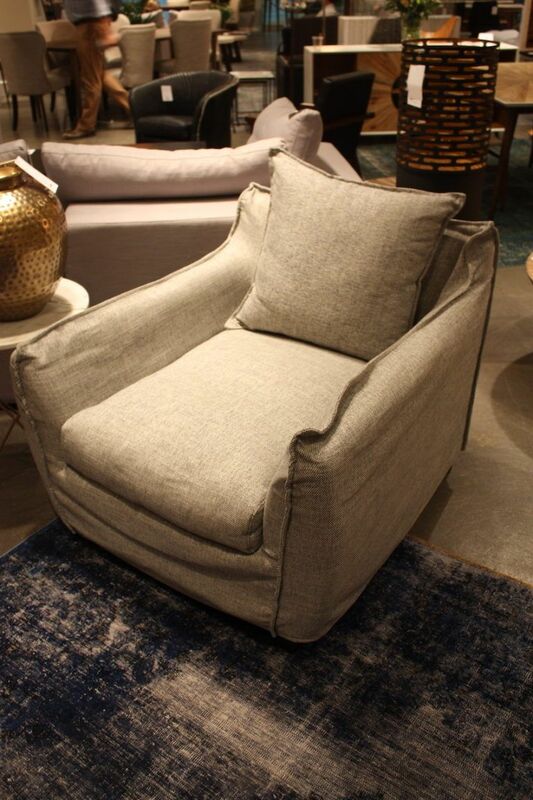 The trend of exposing seams on upholstered furniture is alive and well, as in this relaxed chair from LH Imports. The rugged burlap style fabric, slouchy shape and exposed seams are the right style for a very casual living space. 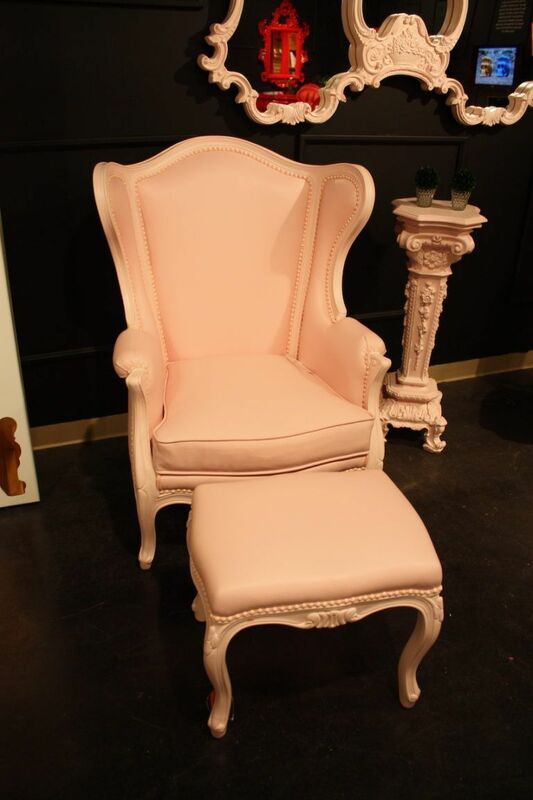 The armchair is great for a shabby chic or upscale farmhouse space. 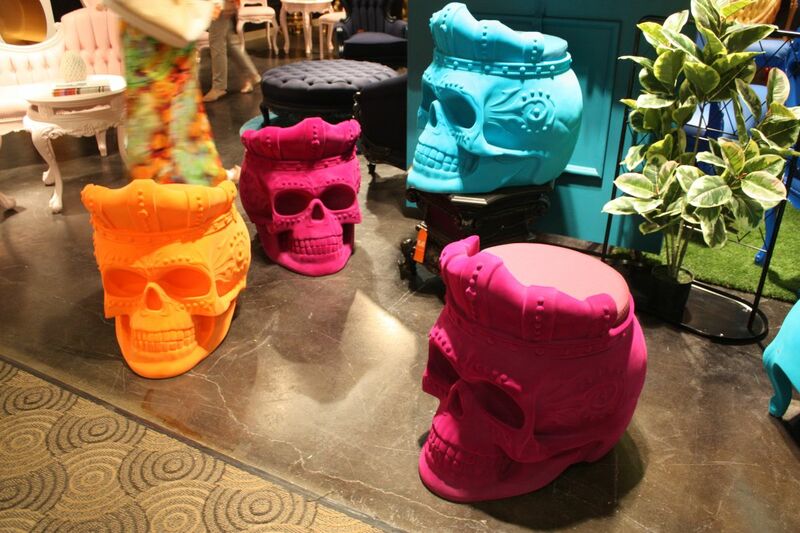 At the other need of the design spectrum are these fabulous chairs from Nick Alain. 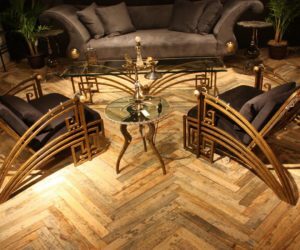 The designs are a magnificent combination of retro, luxury and a good dose of steampunk — truly the definition of unique! 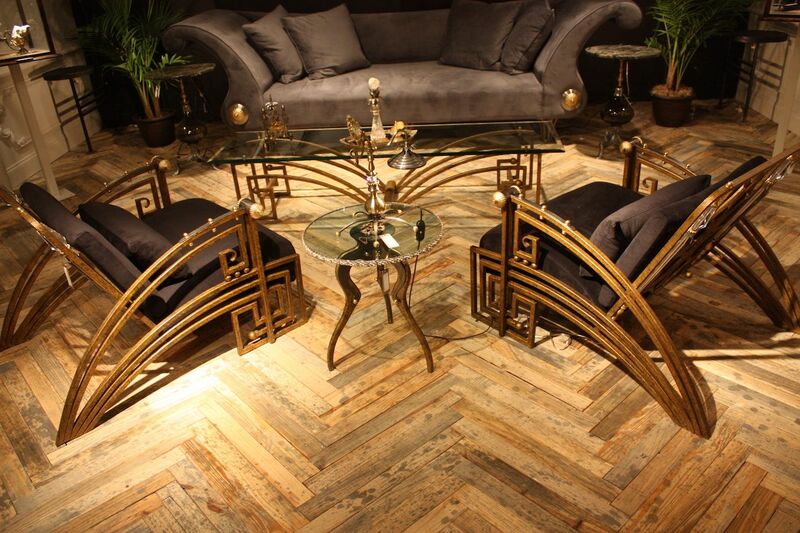 The arms of these chairs are dramatic Art Deco curves and squares that meld into one another. The matching coffee table sports a similar design and the anthropomorphic megs of the small table are unmistakable steampunk. 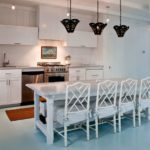 In the realm of bungalow style, you can always count on Selamat to provide stylish pieces. 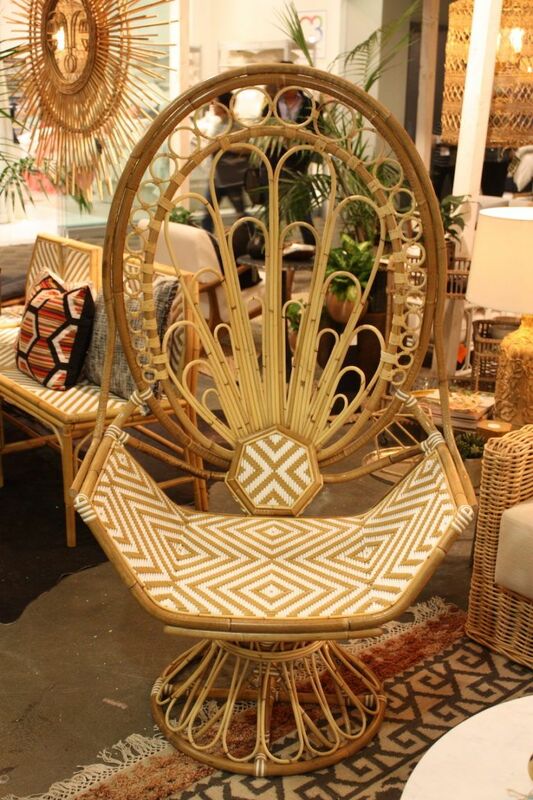 This year’s new collections includes this peacock style chair that features the same type of woven two-tone finish used on several new introductions last season. 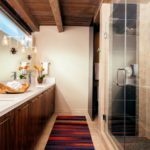 The silhouette never goes out of style and is a great addition to a casual, bohemian style space. 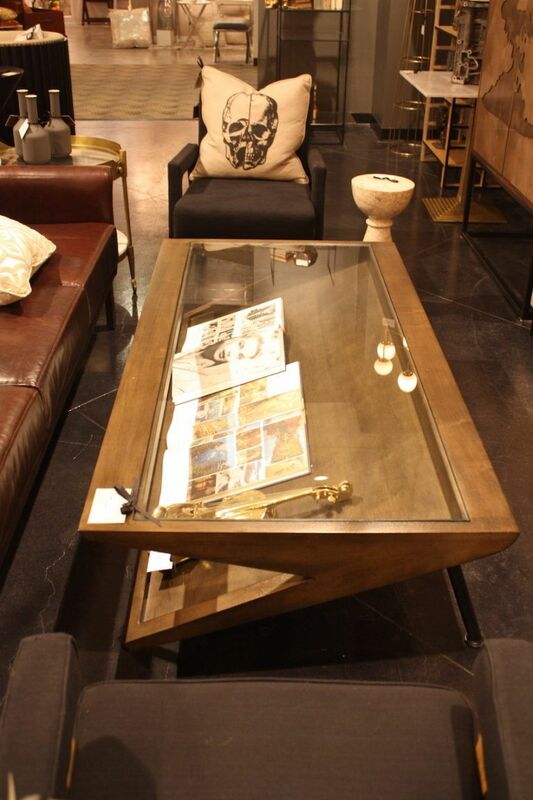 Avid readers will like this glass-topped coffee table from Noir. The angular section is supported by metal legs. The slanted shelf underneath displays your favorite books and magazines, keeping them close at hand when you want to indulge. Pacific Green has been a favorite because of the unique leather, hide and wood designs they have created. 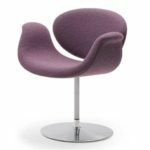 This year, we fell in love with this Eclipse chair, not just for its fluffy holsters, but for the fact that it’s a cross between a love seat and a deep chair. The attached table is an added benefit, letting you perch your teacup while you snuggle in for a good read. 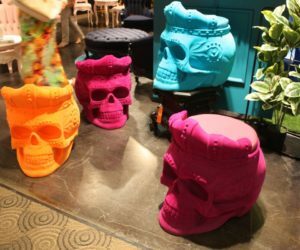 We’ve featured POLaART before, but this season they introduced not only bold skull stools flocked in a brightly colored finish, but also a collection of pieces in the proverbial millennial pink. 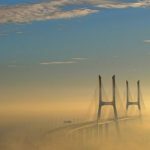 The softer tone is a departure from the striking colors usually used, but they are still distinctive and modern. 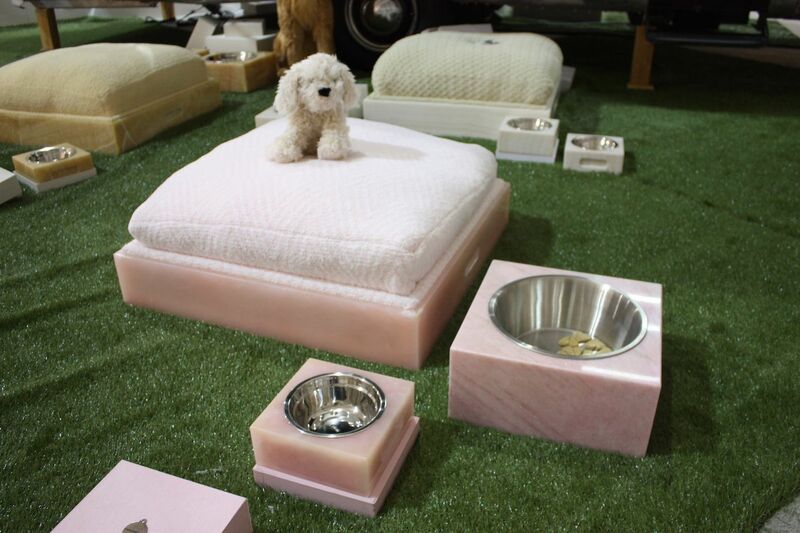 We could not leave out our four-legged friends, and pet owners who like to pamper their pooches will love Stonestreet Decor’s pet beds that sit in an onyx base. 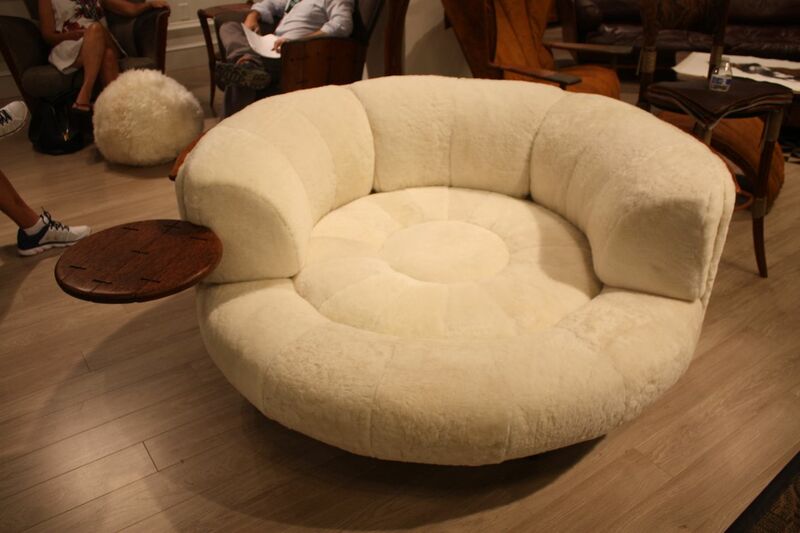 Besides being luxurious, that are absolutely the softest and cushiest cushions we have ever felt. Matching dog bowls home with a stylish cover and in a beautiful box for gifting. While there are currently two sizes, the designer is custom making larger beds for bigger dogs. 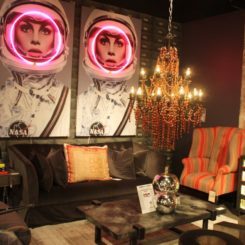 This is just a sample of the great things we saw at this year’s Vegas Market. 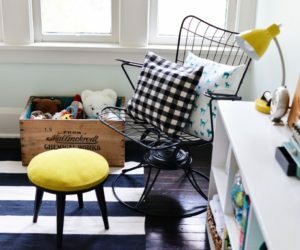 Keep an eye on Homedit for more focused selections that will inspire your decor!